this newsletter is really the first half of a very long one. The second part will follow in the second week of November and contain info about the AGM, the IPA open session at Frankfurt and the image campaign for educational publishers as well as a report on the "Content for education conference" which took place in Brussels at the end of September. The new website, the Frankfurt Book fair and the BELMA kept me very busy over the last few weeks - which is why I couldn't complete this newsletter as I had planned to. But I think you may find some entertaining and useful reading in this incomplete edition as well. I also recommend to have a look at the new EEPG website. Even though not quite finished, it is already so much easier to navigate. You will finally be able to find all the presentations from the previous networks very easily. Please log in with the existing password. Finally, a word about the last AGM. Almost all publishing houses attended and we had very good discussions about the purpose and the aims of the EEPG. I will sum it all up for the next newsletter - this is just the teaser. Surprisingly, out of the 49 entries, only 6 were completely digital, the rest was either printed or a package. The level of quality of the submitted entries was extraordinary this year, so that 15 prizes were awarded altogether. As already published in the BELMA newsletter, the winners came from 11 different countries and there were 14 different subjects. The winners are online on the BELMA website. Some discussions on how to make the BELMA more visible are going on. It is felt that the importance of the award is not made clear enough. In the context of discussions about quality of open educational resources versus curated (or professional) content as well as copyright discussions, it would be good to have more best practice examples on display. For next year, a PDF leaflet with sample pages from the winners (or even the shortlisted entries) is planned. 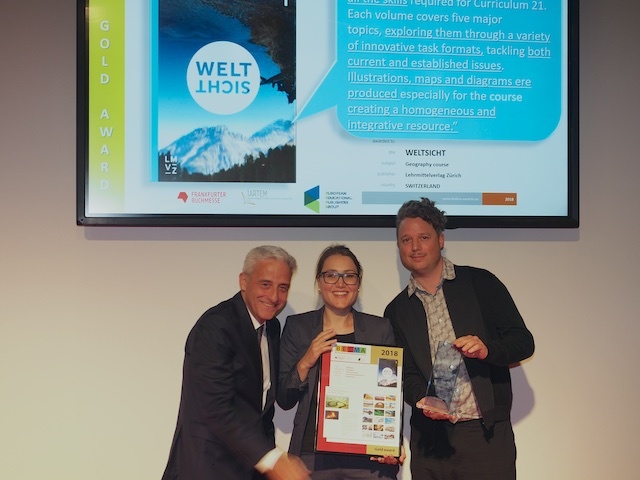 Already this year, the marketing material for the winners was prepared well in advance, so that publishers were able to tweet their successes straight away. 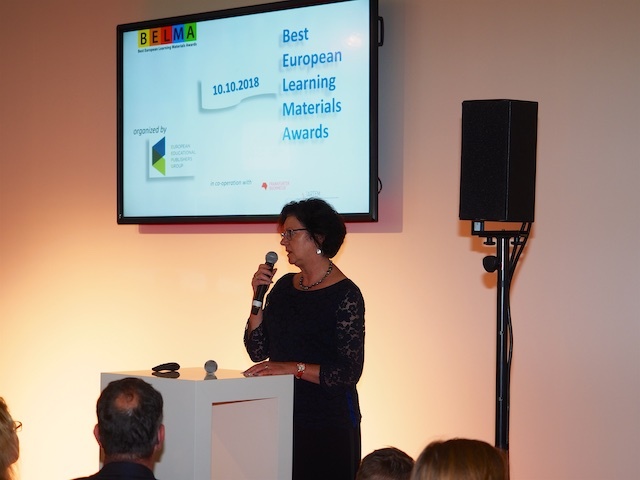 Frankfurt Edu sponsored the prize giving event (there was a discount for the reception) and the managers pointed out to us that the BELMA ceremony is very important for the Book Fair. Every year, it draws more interested people. There were many editors and designers from other publishing houses who stopped by the EEPG stand afterwards and had a look at the materials. This year, the presentation itself could also be seen on the screen at the EEPG stand. The second network meeting in 2018 took place in Helsinki on 14th and 15th of June. It was hosted by Otava and focussed on the "Changing Role of the Publisher" with two sub topics: from "Product portfolio to service portfolio (business models)" and "Best Practices: R&D Cooperation with Schools". The meeting was attended by 23 colleagues from CET (Israel), CJ Fallon (Ireland), Learnetic (Poland), Otava (Finland), Profil Klett (Croatia), Vicens Vives (Spain), prosveta (Bulgaria), Ranok (Ukraine), Sviesa (Lithuania) and Zvaigzne (Latvia). Day one was spent in Otava's wonderful rural conference centre in Toukola. Teuvo Sankila sent a video clip because he was still at the conference in London about "How can textbooks help raise attainment and reduce inequalities?". Please go to this blog to find out more about it. In Toukola, Nona Ratia from Otava, presented a publishing house inside a publishing house and showed how new ideas can be tried out inside a well-established context in general as in educational publishing. Case studies form Finland, Ireland, Poland, Ukraine and Spain (a joint publisher/university project) focused on diverse challenges both political and technical. Day two was spent in the hotel Torni in Helsinki and started with the keynote by Najat Quakrim-Soivio on "Assessment and Evaluation". The speaker gave some very interesting insights into both the Finnish education system and the different methods of assessment and evaluation. This was followed by case studies from Finland, Lithuania and Latvia and a report by Teuvo Sankila about the above mentioned conference. The presentations and the detailed agenda can be downloaded from the new EEPG website. Please note that you have to be logged in. 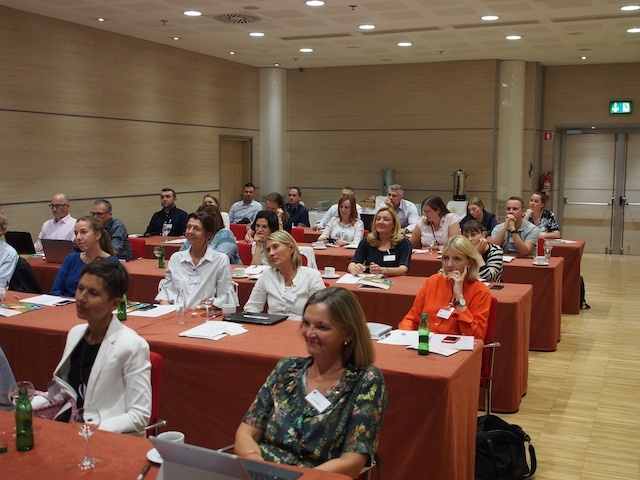 On September 6th and 7th, the EEPG, together with our host Rokus Klett, organized the EEPG Open conference "Content marketing: Transforming Ed Pub". Even though the conference was heavily promoted at various IPA meetings, through personal emails and twitter and newsletters, only one non-member publisher sent participants. This was surprising since before the event quite a few non-members had expressed interest. Questioned afterwards, some people gave feedback regarding the difficult date. This means that for the 2020 conference we will have to look at possibly new formats as well as dates. The conference was attended by 36 colleagues from Veritas (Austria), Prosveta (Bulgaria), Profil Klett (Croatia), Systime (Denmark), Otava (Finland); Sviesa (Lithuania), Learnetic (Poland), Art Klett (Romania), Kreativni centar (Serbia), Rokus Klett (Slovenia), Natur och Kultur( Sweden) and Ranok (Ukraine). The venue was the Austria Trend Hotel in Ljubljana. Day one started with two presentations from a Slovenian (Janja Zupancic) and a Croatian (Nastasa Mozgon Kauzlaric) headmaster on how they see educational challenges, what they expect from publishers and how they can and would like to cooperate with publishers. After lunch Katie Roden gave an inspiring keynote on "What makes content marketing different?" There will be a video available of her talk but our video producer won't be able to deliver the final cut before the end of November. The presentation was tailored to the educational market (even though bringing lots of examples from different areas) and an excellent follow up to last year's talk by Stephen Walsh. All presentations are online. 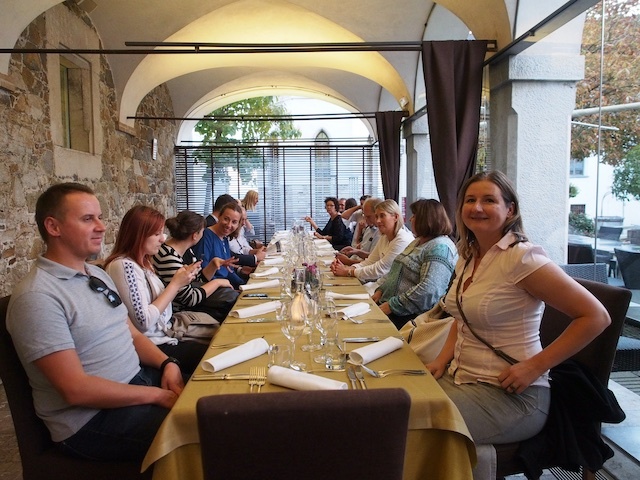 The evening was spent with a boat tour, a walk through the city and an excellent dinner at the castle in Ljubljana. On day two, the publishers from Rokus Klett, Ranok, Systime and Otava gave presentations about their ideas and practices concerning content marketing. They sparked off interesting discussions amongst the participants. One of the highlights of the conference was Katie's impromptu workshop "Lessons learned" which picked up on the various issues that had been discussed during the conference and gave everybody some very practical ideas on how to improve customer relationships and work on "different" marketing concepts. She used slide 11 from her presentation to kick off the workshop. It is worth looking at this slide for inspiration. On 17th and 18th of July, there was a European Workshop on Integrating SDG 4.7 in Textbooks at the Georg Eckert Institute for International Textbook Research in Braunschweig, Germany. This was organized by the Mahatma Gandhi Institute of Education for Peace, UNESCO and Engagement Global. If you want to know more about the back ground, please check here. As you probably know, the Education 2030 Agenda has a new scope. and aims to ensure quality learning outcomes for all, throughout their lives. The workshop mainly focused on best practice examples of embedding in textbooks. It was attended by educational experts in university and politics but only two representatives from educational publishing, Jane Mann from Cambridge Assessment and me. The outcome will be published shortly. Meanwhile, please download this useful guidebook. The meeting took place on June 28th and here are the most important points from the minutes. We will have to find a space on the new EEPG website to present these word documents for members only. I have taken out the parts that are obsolete because new developments have superseded them. José reported some unexpected developments at SCCR in May. The report from the Chair proposed to go ahead with preparation for a diplomatic conference for a broadcasting treaty, despite the language still being vague and not agreed by the SCCR factions, so this is likely to stay on the agenda for another year or so. The exceptions debate is alarming, with shocking negativity towards copyright and publishers by some factions. The global south is still pushing for education and library exceptions. Sylvie is working heroically on her initiative, but this is not yet a done deal. 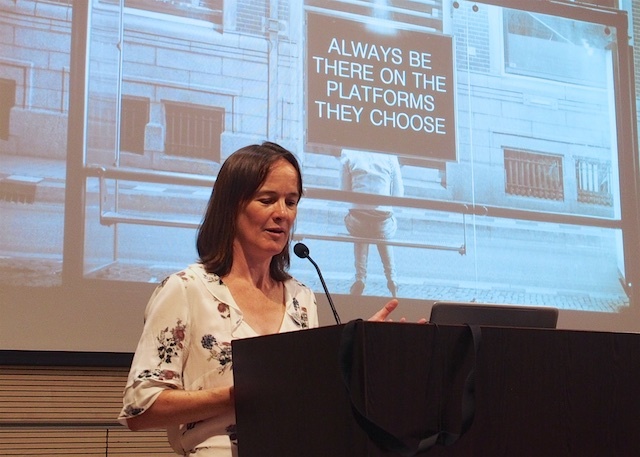 IPA will continue to invite publishers from the south to explain that broadening exceptions undermines their business models and hence capacity to innovate and provide for local needs. Despite the debates and disputes, no document on educational exceptions agreed by all factions yet exists. José recommended following the IPA blogs on SCCR. Benôit Müller from WIPO had been scheduled to attend this meeting but in the end was unable to travel. An Action Plan for the Publishing Industry derived from the Yaoundé conference had been circulated, and it is hoped that this will spread the focus beyond Geneva to regional meetings and further studies. Recommendations for academics who might contribute reports and research papers supportive of our position would be helpful. IPA Copyright Committee is looking for fresh issues to introduce into the SCCR debate if a broadcasting treaty is settled, especially relating to rights such as the resale right. Vera Castanheira has been appointed as IPA Counsellor for International Copyright Policy and Programmes. Vera is a lawyer with considerable experience of WIPO and working with the Portuguese Government. Her role will be IPA strategy globally. Work on national submissions will remain with Lenz Caemmerer. EPF position paper on educational exceptions resides with the Copyright Committee for ratification. Regular contact between FEP and EPF now involves a program of monthly conference calls, and a regular meeting scheduled for the afternoon before future EPF meetings. Copyright legislation in Ireland is threatening an outcome similar to Canada has progressed rapidly through two stages of four, despite lobbying efforts by ICLA whose recommendations have not been adopted by the government. Urgent support is needed from EPF and IPA. Kristenn urged that his FTP committee, IPA, and EPF all wanted to invest in this issue and to progress the concept of an Index to be applied to the status of educational publishing in different countries. After Reykjavik he had proposed a program of development, and with this in mind GT had circulated a list of criteria for discussion. Now we need feedback on this list, prior to more activity to survey for information and status reports. Iris pointed out that some of the issues identified may in fact be helpful to publishers and should not necessarily be used as criteria for a 'black list'. More discussion is needed on this point. Wilmar raised the issue of whether EPF should gear up for more outward communication with third parties such as the international agencies, in the spirit of the 'value of publishing' exercise still ongoing with an EPF task force, or are we more about bringing members together for mutually beneficial discussion? What message do we want to bring, and to whom? 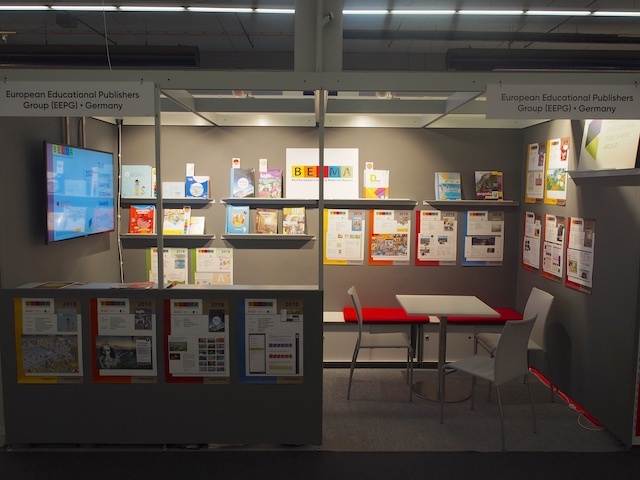 We are the only association with extensive international connections representing the voice of educational publishers, and others have come to us on that basis. How do we build on this? It was suggested that we should evolve a 'modest but reasonable' plan in time for discussion at the next meeting. As you know, the amendments to the text of "Copyright in the Digital Single Market" were adopted on September 12th. Here is the press release. And here are is the full explanation. An easier to understand one is by the law firm Morrison Foerster. But it might be equally interesting to look at some popular interpretations of what this will mean. Here a comment by The Verge, an American news and media network operated by Vox Media. Here is a comment by Julia Reda, a German MEP, opposed to the copyright directive. 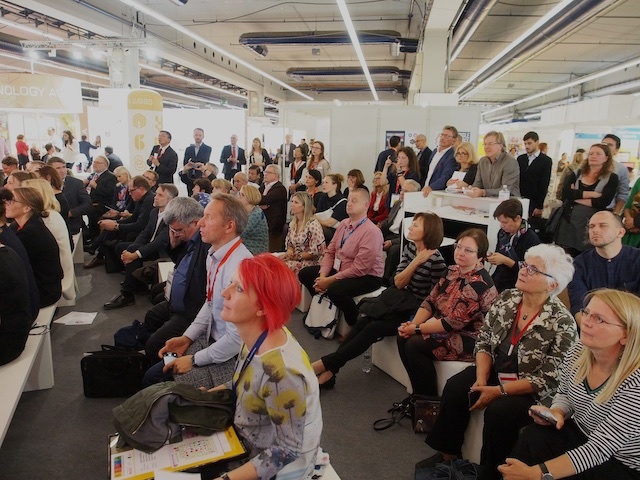 Just after the vote, the conference I mentioned in my introduction (and which I will write about in the second half of this newsletter) took place to help convince MEPs of the importance of educational publishers. Here is an interesting analysis by PwC, which I came across when searching for something completely different. It is about textbooks in the Netherlands but contains interesting insights that are also valid for other markets. This UNESCO publication, Rethinking Education, Towards a global common good? is a little older, from 2015. While it focusses a lot on areas outside Europe, it is worth browsing through. Also see the box on "Teachers highly trained and regarded in Finland"
And here is something completely different from EdTech. At the summit in Madrid, Spain, Sense Education from Israel were named number one startup with their AI software that helps teachers assess and give feedback to students in a personalized way. Hope you enjoyed reading this and please watch out for part 2!